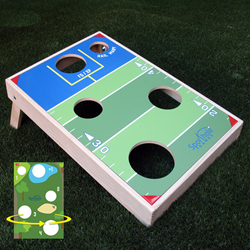 Sporthole Games lets tailgating and backyard party enthusiasts play their favorite sports, pub & kids games by tossing bean bags in a fun, competitive way. Unique two-sided game boards let fans play baseball, football, soccer, golf, shuffleboard and other popular sports. Tailgaters are always on the lookout for the next big thing in outdoor games. Sporthole Games—one of six companies with breakthrough products featured on a recent episode of The Big Pitch—has responded with a bag-toss game that takes a popular and proven format to a “hole” new level. Eighteen innovative games bring the strategy and skill of sports such as football, baseball, soccer and golf to backyards, barbecues and tailgating adventures. The Big Pitch, which airs on the Fox Business Network, gives industry innovators five minutes to impress a panel of product development experts. The pitches were filmed during The 2016 Sports Licensing and Tailgate Show in Las Vegas. Ryan added, “when playing Sporthole it's not just about throwing bags at a single hole, but rather playing sports, pub and kids games by tossing bags at holes that are strategically placed on the sport or game of choice. These unique games combine a traditional bag toss game with the same scoring, strategies and challenges of real life sports and games. They're becoming popular tailgating games across college and professional football and baseball stadium parking lots.’"
The entire episode is featured on TheBigPitchTV.com web site, where traditional tailgaters and home tailgaters (aka “home-gaters”) can purchase products at a special price. View the Sporthole Games segment at https://sportholegames.com/index.php/news/.